pyLoad is a download manager that works mainly through a web based interface and has capabilities that traditional download managers lack (for instance, remote management). It's considerably lightweight and packs a lot of features. It also does not require any extra installation (or any installation, for that matter!) to run and is portable. However, on the downside, the initial configuration can be confusing for some users and therefore it's not a very common download manager. This guide will attempt to walk you through the basic configuration and download addition/process. As always, link generation is automated and the plugin is maintained by RPNet so you can be sure of prompt updates/fixes in case anything breaks in the future. Although, this is not likely because the plugin uses the API exclusively. 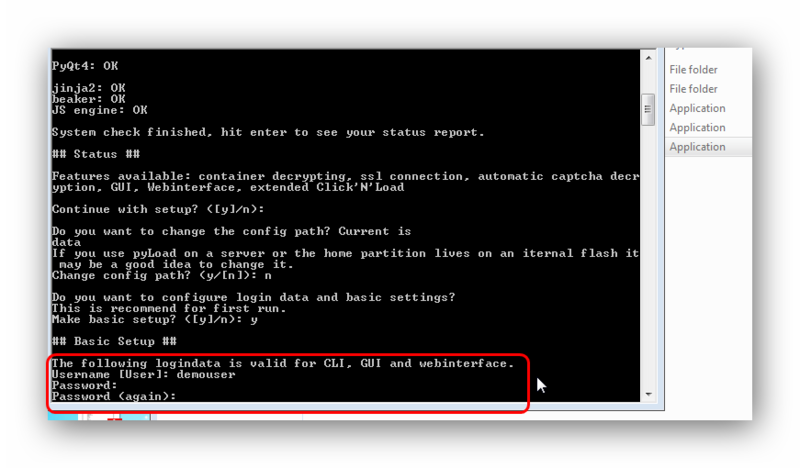 After obtaining the details required above, follow the steps below to learn how to initially configure pyLoad. 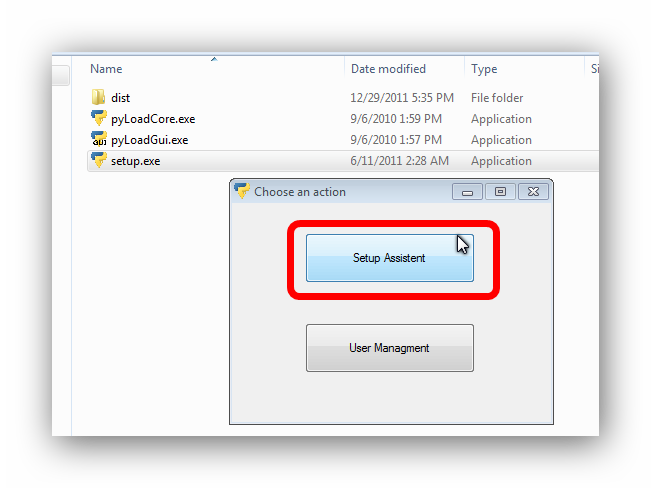 1) In the extracted folder, click on setup.exe. 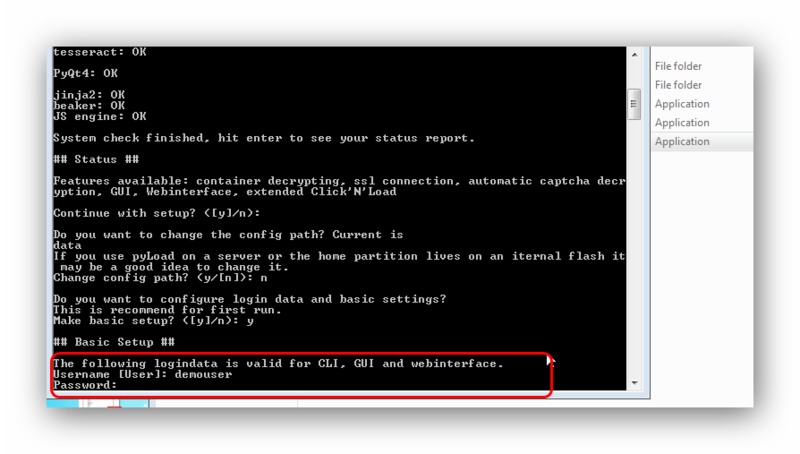 2) Click on Setup Assistant. 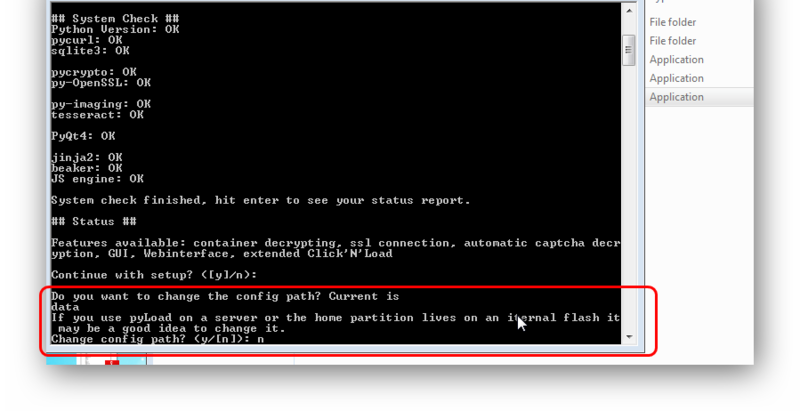 This will launch a command line tool that will walk you through basic setup. 3) Type en for English. Remember, any options that have a  bracket around them are default options, so if you'd like that option, simply type nothing and press Enter. This tutorial will type everything in for clarity, however. 4) Leave the config path to what it is (references itself inside the folder). Default option is n (no). 5) We'll configure login and basic settings, so y (yes) for this option, which is also the default. 6) Specify a username. This is NOT your RPNet Username. This is the username you will use to login to the web client of pyLoad to actually use it. This can be anything you wish, it does NOT have to be your RPNet Username. 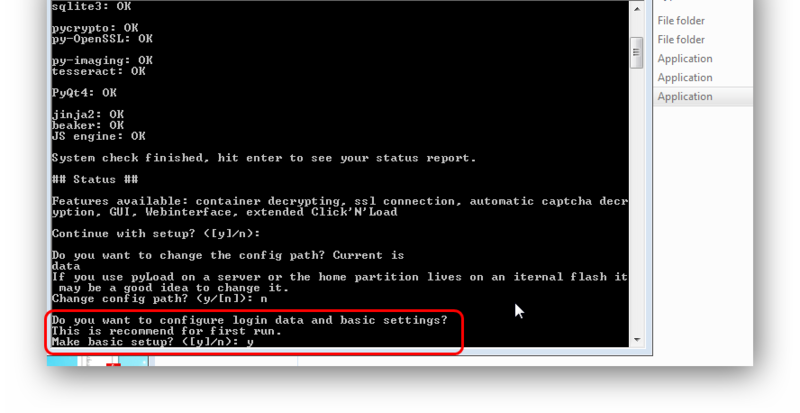 7) Specify a password for the username you created in the previous step. Remember, this is NOT your RPNet Password. The password you type in here will not be shown, so you need to be very careful with what you type. You will be asked for a confirmation type again, so remember what you typed. 8) Specify the password again. This will not be shown, so make sure you typed matching passwords. 9) Select y (yes) to enable remote access. While not required, this may come in handy later. Default value is yes. Language is, as always, en (English). The Download folder value should be left as is. Please don't change it, as it references itself inside the pyLoad folder. 10) Max parallel downloads is default 3. But the tutorial has set it to 1 for example purposes. You can change it now or later to your desired value. We don't need to configure ssl, so let that stay as n (no) which is also the default value. We'll use pyLoad through a web interface, so select y (yes) to configure web interface next. 11) Under most circumstances, you'll use the web interface locally (on your computer). 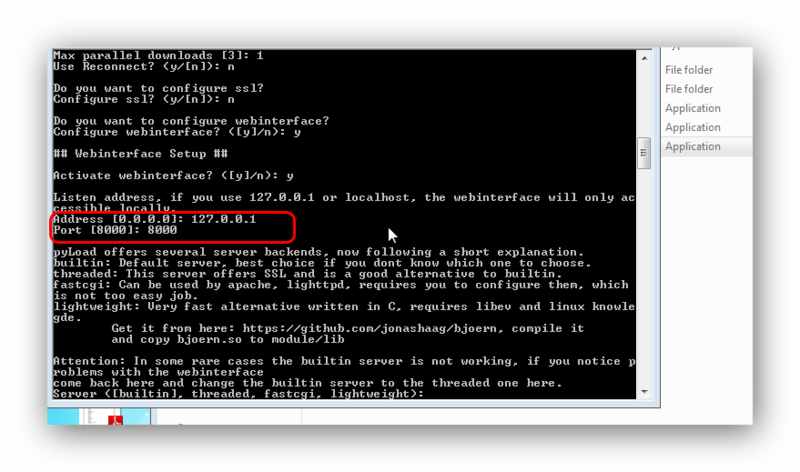 So set 127.0.0.1 for this value unless you know what you're doing and want to have a different public address. The port is 8000 as a default value, which is what you should leave it at. 12) Again, leave this option to the default value builtin. pyLoad will change it as necessary when it runs. 13) That's it. 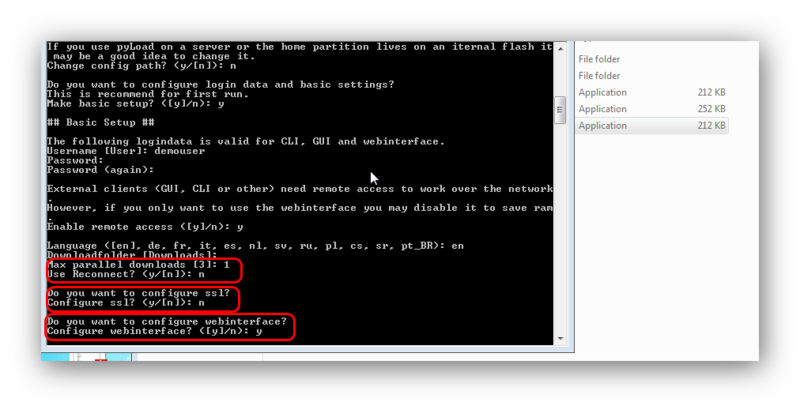 Once you select that, the rest of the configuration is automated and the command window will close. You now have to launch the pyLoadCore.exe file in the folder. The pyLoadGui.exe file is not going to be used since it's not stable and, for the most part, does not work. The pyLoadCore.exe file will launch another command prompt window as below. As you will see the notification will ask you to restart pyLoadCore, so go ahead and do that. 14) The second run will start updating all the plugins. This process can take a while depending on how fast your internet connection is. Once it's done, the command prompt will ask you to restart pyLoadCore.exe. So go on ahead and do that. The third time, it will just notify you that pyLoad has started and is running. 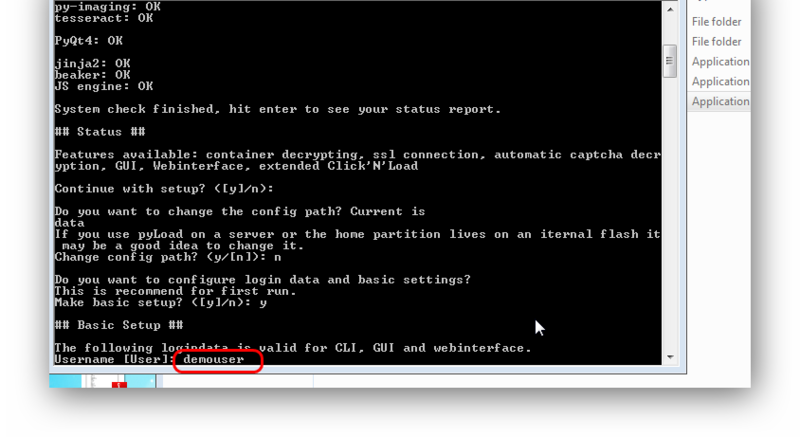 Do not close this command prompt. Leave it running for as long as you use pyLoad. 15) Open a web browser, and type http://127.0.0.1:8000 (the ip and port you specified in the settings earlier) or http://localhost:8000, whichever you prefer (they're both the same). You'll be greeted with a login form. This is where you enter the username and password you created during setup, above. Note, these are NOT your RPNet Username or RPNet Password (or RPNet API Key). 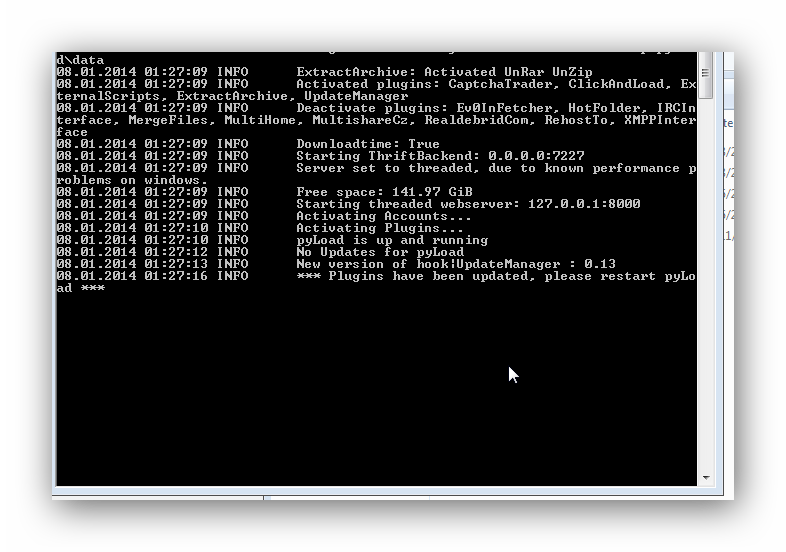 16) Once you're logged in, you need to set up the RPNet plugin first. 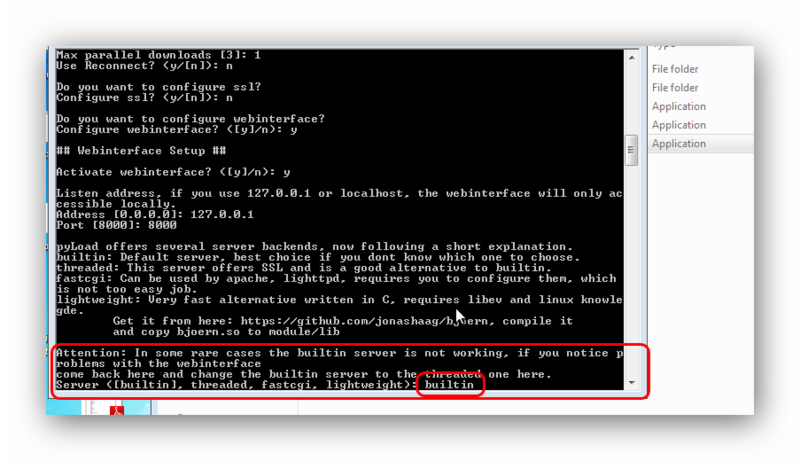 Click on Config towards the top right. 17) There's 3 tabs here. General, Plugins, and Accounts. Pretty self-explanatory. The sub-menus will open when you hover your mouse over them. The General settings are pretty basic and you should go through them all to fine tune anything you need to. To configure RPNet, click on the Accounts tab first. 18) Here, click on Add which will open an overlay box. In Login, enter your RPNet Username. In Password, enter your RPNet API Key (NOT your RPNet Password). In the drop down list, select RPNetBiz. Then press Add. This will add your RPNet account to pyLoad. 19) The plugin now needs to be enabled (it's disabled by default). So click on the Plugins tab. Then hover over Menu. This will drop down a large list of plugins. Look for and click on RPNetBiz. This will open settings for that plugin. 20) Switch the Activated option to on. Leave everything else as is. 21) Now navigate back to Home. Click on Add. This will open an overlay box where you can add links. 22) Name can be anything. This acts like a folder, so name it however you want to recognize it. Links will contain your download links, each one on a new line. Destination can be Queue or Collector. If you select Queue, the links added will start downloading instantly. If you select Collector, the links will be added, but not started. You can add more links (if you want to organize links by folder) and then later start the processing together. 23) Once you've added links (added to Queue in our example), they will start downloading. Since we've specified a plugin for RPNet and entered our account details, pyLoad will generate the link automatically via RPNet before downloading it. Once it's finished downloading (you can monitor this in the Queue window), click on the 'Downloads' icon at the top/main navigation. 24) This is where your completed downloads are listed. They're organized by folders (name, which you specified when adding links). Clicking on the files will give you a download prompt that you get when you click download links on the web. But this is not an effective method of copying files downloaded by pyLoad since it duplicates files (they're served to you from your PC). 25) So we'll just copy/paste them from the downloads folder (which was the default setting in the initial configuration) that pyLoad put them in. Check the screenshots below. 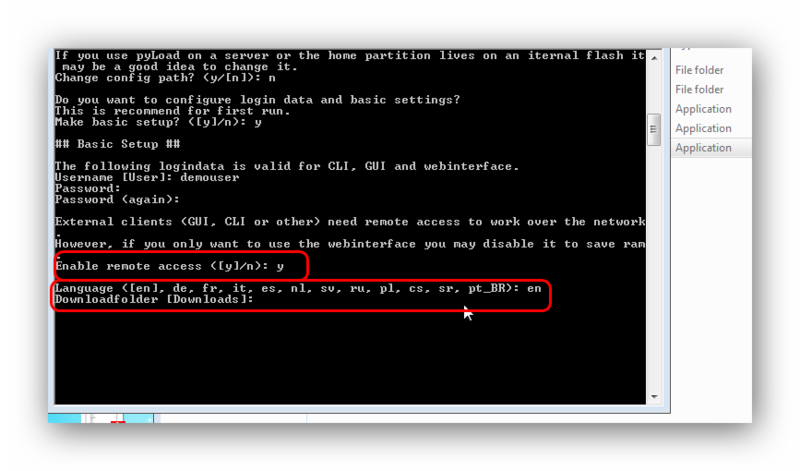 This completes the basic tutorial to setup and use pyLoad to automate downloading from RPNet. This software is meant more for advanced users who have a fair understanding of how command line programs work (for initial config). But this guide should help even the new users get an idea.